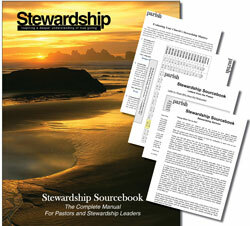 Our 56–page “must–have” Stewardship Sourcebook. The companion 31–page book Organizing and Energizing Your Stewardship Committee. A brand new tool Evaluating Your Stewardship Ministry. Plus, 18 appendices to assist you in your stewardship ministry! These resources are 100% downloadable and provide decades of wisdom about starting and maintaining a multi–year stewardship ministry for any size church. They include a wealth of knowledge about forming a stewardship committee, creating long–term stewardship education and communication curricula, as well as a focus on fund–raising. tghe package contains a multitude of downloadable resources to help develop a successful, sustainable stewardship plan. All of the resources in the Stewardship Sourcebook package are available online at our Parish Resource Center for easy dissemination to your stewardship leaders (re–print rights for your church included!). Price: $29.95 Now just $19.95! involved in your stewardship ministry!